Campagins are used to generate the Collective Review assessments by sending files from your Collection(s) to Assessors to complete. 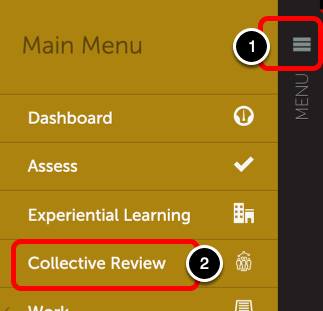 When setting up the Campaigns, you will determine the rules for the assessment activity/workflow that will be applied to the assessments of the files that are selected from the desired Collection(s). The data collected via these assessments can then be reported on using Results Analytics, Student Results, and/or Agreement Reporting. 4. Click New Campaign button. 5. Enter a name for the Campaign. You can also enter a description for how it will be used, if desired. It is recommended that you include specific details related to the assessment purpose, activity, workflow, program, date, etc. in the name of the Campaign. This information will allow you to more easily search for, and organize, your Campaigns over time. 6. Click Choose Instrument to select the Assessment Instrument you wish to use for the Campaign. Once the Campaign is saved, you cannot change the Assessment Instrument. 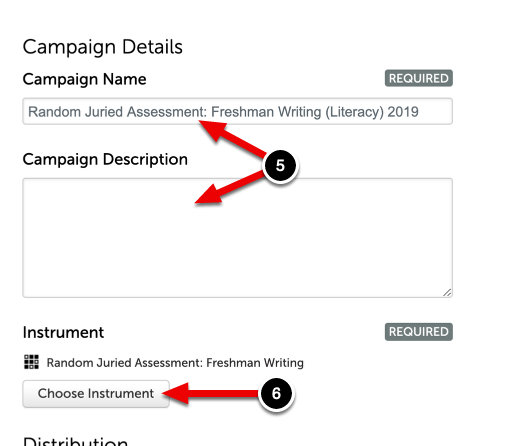 Select this option if you wish to identify the specific Assessors who will receive the files to assess for this Campaign prior to actually dispatching the files. In other words, you are selecting the Assessors in advance of sending the files for assessment. This option allows for random distribution strategies and target sample size recommendations. 1. Click Choose Assessors to select the Assessors whom you wish to receive the files that you will dispatch for this Campaign. Once the Campaign is saved you cannot modify the selected Assessors. 2. Select the desired Distribution Strategy. 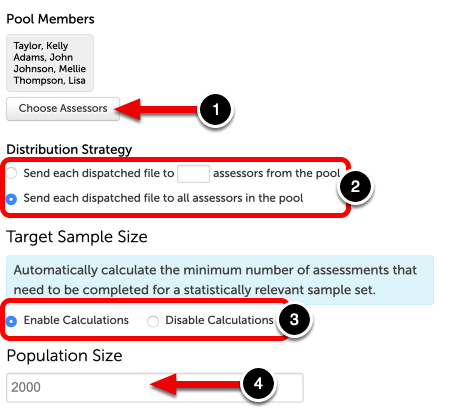 Enable Calculations: When selected, the system will automatically calculate the ideal Target Sample Size (number of files that should be sent to Assessors to assess), based on your Population Size, in order to ensure that it is statistically significant. Disable Calculations: When selected, the system will not suggest an ideal Target Sample Size. The option to enter a Population Size will also be removed. 4. Enter the Population Size if you are using the Enable Calculations option mentioned above. For example, if this Campaign is going to be used to perform assessments on Literacy writing work samples of the 2019 Freshman Students, you would enter the total number of Freshman Students who took the Literacy writing course in 2019 as the population size. Select this option, if you wish to manually identify the Assessors who will receive each file at the time of dispatching the files. You will need to use a delimited list of Assessor and File names for the Basic Dispatch workflow. Random distribution strategies and target sample sizes recommendations are not available when using this option. 8. Click Save at the top of the screen to create your Campagin.